I don't know what hit me all of a sudden, but being back here in my family house for the Easter holidays, I spontaneously decided to go up in the attic and look for my old DrMartens. I found them and all the memories came flooding back: I originally got them on a family trip abroad in 1996, during the whole grunge era. I'll save you the math, I was 13 at that point and too much of a chicken to break them in properly. 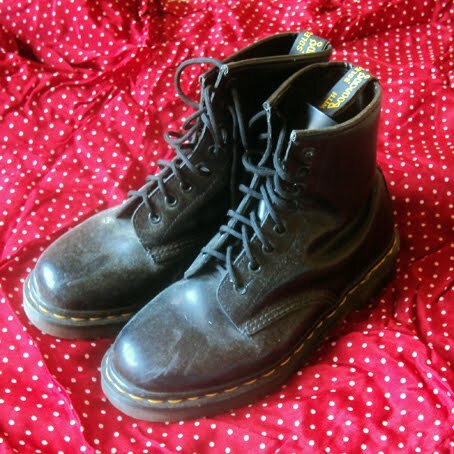 As some of you may already know, Docs are notoriously hard to break in. They *will* break your attitude first, not to mention your feet. That and the fact that shortly after I left my grunge days behind in favor of hip hop (kids that days) was the reason my boots never got the wear they deserved. They've been sitting inside a cardboard box all these years and it's been bugging me ever since. So, I did find what I was looking for in the attic. Vintage(?) 70's, 80's and early 90's clothing, my mum's and mine. It would probably take several days to wash, iron and properly photograph them all. I really don't have the time to do so before I leave, so I decided to just make a big stack to document them for the blog. Phew, that was a lot. I've already tried on most of them and I have a feeling many of them will become regular staples. Who knows, I may even start wearing my DrMartens again! As Wendy Brandes would have said, it's like growing your own vintage. Quite handy, especially in a country like Greece, where - like I said before - vintage or plain second-hand shops are scarce. Feels like shopping without spending a dime! But still, I refuse to call my Dr Martens vintage. I may have bought them 13 years ago - and some people are actually claiming that the 1990's are vintage - but NO. That would just make me feel old. ax t floral kolan 8elw na dw! Oh....the attic, my favorite treasure place....!! !Since last year I've started an excavation project in all my relative's attics, and I' ve already discovered more than 30 dresses 15 tops 5 jackets and i'm not finished yet.......he he!!!! mipos..leo ego..mipos..na mas kalesi spiti sou gia tsai..tsai...tsai...eee ke mia e3ormisi stin doulapa sou????? I wish I'd kept hold of my old docs! loved this post ad must have taken you ages to record all of them! a blast from the past indeed!!! Ha ha! You hit the personal vintage jackpot, beautiful. Can't wait to see these in rotation. i love snooping around through my moms old things, as for mine i simply re-arrange the closet..i still have it all(all the good stuff that is)..and i still wear the most! queen b. posted some outfits with doc martin's and they were quite nice!